Conniff Construction offers a variety of services, including contract management to assist an owner in minimizing the stress that comes along with any project. We handle our projects from start to finish with only the best quality craftsmanship in the industry. The contractors at Conniff are ready to meet your needs. Handling documents, overall management, estimates and construction, our comprehensive process ensures that your project is done accurately within the framework of your time and budget. Conniff Construction has been providing general construction design and remodeling services for over 40 years. We work with our clients to make sure their property needs are met and provide outstanding craftsmanship throughout the project. We never consider a project too small or large. We welcome any future project you see fit for your business, and we encourage you to contact our professional team or give us a call at 732-350-5005 to schedule a consultation.  Conniff Construction is a commercial construction company serving Holmdel, Colts Neck, Marlboro, Manalapan, Toms River, Brick, Jackson, Point Pleasant, Freehold, Millstone, Belmar, Manasquan, Manahawkin, Lavallette, Forked River, and surrounding NJ communities.